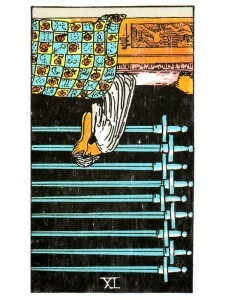 Nine of Swords (R) says your problems are real and because you cannot directly attack them – you have chosen to keep your anger and resentment hidden within yourself. You are becoming inflexible, fixed in your beliefs and ideas. You are using narrow – mindedness as a defense because of the fears and insecurities you have experienced. Anger turned in on itself, soon becomes depression which leads to self – doubt and shame. These deep, hidden feelings will remain until the anger is released and true changes are made. Release your anger in a creative way – choose to believe that tomorrow holds new promise and hope. Be ready, be patient and believe that you have won. Trust that good news is coming! Be patient and believe in the blessings that are coming. Do not rush anything now – allow your tool to be your faith and trust in God’s power to turn your situation around. Draw from his energy for guidance and support as you work through your self-doubts. You are being too hard on yourself, too idealistic. Over-working, thinking too much. The mind and its store of information can be either a prison or what liberates us from prison. How are you putting yourself down? What is the source of your depression? How have you been cruel and thoughtless or who has been cruel and hurt you? What thoughts or nightmares are plaguing you? Next to High Priestess: Be prepared to face the truth and do not be afraid. Next to Star: Have faith now and thank God for the blessings you have received – all is not lost. Aces on all sides: Look for a new beginning and accept that what has happened is for the best. In the first position: As knowledge at this level increases, each increment of growth brings noticeable increments of greater responsibility. The easy path is the one in which the responsibility is as eagerly sought and welcomed as the knowledge. In the second position: Too much or too little information/ thinking. The likelihood that you are too intent on the information itself instead of what it is to be used for. In the third position: While the number of options may be confusing, be flattered, then do your review and make your cuts. Some will make the team, others will not. In the fourth position: Even with the nobility of such an altruistic passion as yours, you are not relieved of the responsibility of fulfilling what we call the “lower” emotions – to love, possibly to mate, to experience sensual pleasure, to enjoy family and friends and simply humor. They are called “lower” only in that they usually come first, not that they are any the less important. In the fifth position: This may feel more like the pressure of what to do next. The mind may have overestimated its role in this matter. Give the other levels equal time and your headache should go away. In the sixth position: Make no changes in your emotional house while your mind is overloaded or confused. This card can show one as being overly idealistic and impatient in the drive toward truth. Be gentle with loved ones especially, but go easy in your day to day encounters as well. In the seventh position: The temptation out of fear to bury your head in the sand, to avoid the information as if your not knowing will make a problem go away. In more esoteric terms, some will argue that the quest can be fulfilled on what they call faith alone. It cannot. That faith alone is actually seeded with doubt, with the fear that if it sought an answer, it may either not get one or get one it did not like. In the eighth position: You may be having trouble getting things to add up these days. In the ninth position: In a distortion of this archetype, in one extreme the heart may be overwhelmed and saddened by its new awareness. Some hearts may be initially less than enthusiastic about what the mind has presented, balking at responsibility and heightened compassion. In the tenth position: Be on your guard as you experience this archetype in the near future, against both the sin of pride and the opposite extreme – denial of self-knowledge. Stay in the moment, trust your spirit guides.